Emily has been helping out on the blog for a good while now, and over the course of the last few years her reading preferences have naturally developed, with a slightly reduced emphasis on fairies and more tolerance for darker elements in her books. This change comes through strongly today as this post sees Emily returning to a series she wasn’t very keen on when she first tried it; this time around, she sped through the books in a few days! What’s the name of the book, and who is it by? 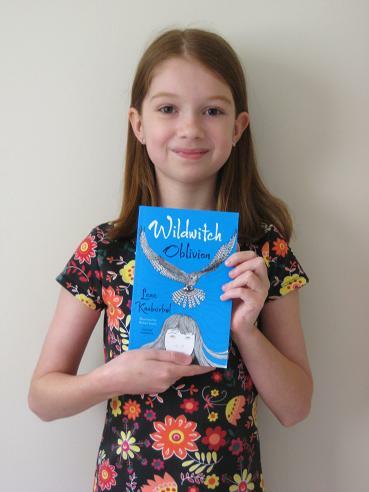 The book is called Wildwitch: Oblivion, and it’s by Lene Kaaberbøl (and it’s translated by Charlotte Barslund, review copy from Pushkin Childrens’ Books). Did you like it? Why (not)? I liked it because you never knew what would happen next, and The Nothing (half-human, half-bird) was very funny. I also like how cat always gets his way, even if Clara says no! What was your favourite part? Would you recommend this book to other boys and girls? Why (not)? Emily, thank you very much. I was pretty sure she’d get back to the books eventually as they’re a beautiful series, and she did enjoy the first one, despite its dark tone. Luckily, she’s read a couple of darker books recently, including one she got for Christmas, so she was in the mood to try something a little more challenging than her usual fare. It was a bird of prey, not a very big one actually, but between the white walls of my room it seemed enormous. Fanning its tail feathers, pale apart from their black tips, it braked sharply, froze in mid-flap for a split-second, then made directly for me. I instinctively held out my arm and it landed a little clumsily on my wrist. Its yellow talons contracted and went through the sleeve of my jumper and into my skin, but even so the bird had to keep flapping its dappled wings to stay upright. That’s certainly an impressive beginning, with more than a touch of the Harry Potters about it (not sure why they couldn’t just email, though…).